We’d love your help. 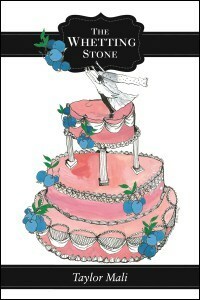 Let us know what’s wrong with this preview of The Whetting Stone by Taylor Mali. To ask other readers questions about The Whetting Stone, please sign up. This chapbook broke my heart. What makes it even more heartbreaking is that the departed belovèd's name is Rebecca. 😩 Just plunge that knife in and twist. Ah, Saturday...I think I'll read some poetry since the internet is so grim of late. This chapbook is a knife. It is precise as it flays you open. I would be hesitant to share a single poem, cut from whole muscle, because it would no longer move or bleed the same way. You must read it all, from start to finish, and I'm sorry because it will hurt. Although Mali became well known for slam poetry, appearing on the HBO Def Poetry Jam Series, these poems are written in a quieter, more literary form. He even includes a sestina and villanelle. The topic requires a gentler handling, since you'll want to read them in private at your own pace. Sorry not to give you a writing sample, but it seems unfair to quote from a 19-poem collection. Together, the poems carry the weight of a much longer book, but you need to experience them in the order Mali chose. So, I remember entering into the Rattle chapbook contest, and then getting yet another "sorry no" email from them. But in that "sorry no" email, Rattle also announced the winner - Taylor Mali. Now, Taylor Mali has been a HUGE influence on me - like, his poetry is what got me into spoken word poetry. I credit him as one of the people who has changed my life for the better. So when I find out HE won the contest, I was actually honored to have lost to him, in all honesty. AND THEN, I got a copy of his So, I remember entering into the Rattle chapbook contest, and then getting yet another "sorry no" email from them. But in that "sorry no" email, Rattle also announced the winner - Taylor Mali. AND THEN, I got a copy of his chapbook in the mail with my Rattle poetry magazine. I was all kinds of excited to read it. And boy, am I glad I did read it. Beyond the story of the chapbook, a central theme I caught onto right away was Mali's sense of Survivor's Guilt. Suicide is a tragedy, and when it happens to people you love, you feel responsible in some way for it. Even though you weren't part of the actual killing process, you feel guilt kind of pressing into your gut because you think that you could've done something, you should've done something, I did this, which probably helped the person come to consider suicide as a viable option to solving problems, etc. This kind of survivor's guilt cuts deep and in completely different ways than normal. Mali explores this throughout the chapbook. It was literally the push I needed to write about my own sense of survivor's guilt. It sat with me, instead of compel me to move on with these feelings. It kind of felt like listening to a Linkin Park album, in that sense. There is so much power in that. Often, I think we're all so afraid to sit down and confront our feelings because we have a feeling we won't be able to handle them solo. When someone "sits with us," we're better able to process what's going on, because we don't feel so alone anymore. Somebody else gets it, and they can communicate it. I can do it, too. I am a big fan of Taylor Mali's work, and have been lucky enough to see him in performance several times. This is a fantastic book, filled with poems that surprise, move, despair, delight. Well worth reading. This is the saddest I have ever been to give 5 stars to a book. It's also the quickest book to have wrecked me. and yes, I wish I could write like this. beautiful. I have been reading a book of poems every day this week, and this one is one I'll return to again, even though it is such a difficult subject. They say "Write what you know" but Mali shows us that the best poems are the ones we don't want to write, the ones that we scrape from the inside of our riskiest corners. Here he filets his darkest secrets...and yet his honesty frees even the reader. I won't elaborate because spoilers are the worst, but read this book and find out. This book won the 2017 I have been reading a book of poems every day this week, and this one is one I'll return to again, even though it is such a difficult subject. They say "Write what you know" but Mali shows us that the best poems are the ones we don't want to write, the ones that we scrape from the inside of our riskiest corners. Here he filets his darkest secrets...and yet his honesty frees even the reader. I won't elaborate because spoilers are the worst, but read this book and find out. This book won the 2017 Rattle Chapbook Prize contest and is a beautiful example of how a small book can successfully circle a single topic like an oyster shell around a pearl. It's highly focused but not obsessive--you sense there was a life lived in between the writings of these poems--and brave in every sense of the word. I hope publishing it frees him from the unbearable haunting of what-ifs. "And I was going to write a poem about how fire is the only thing that can make a person jump out a window. And maybe I'm an idiot for thinking I could have saved her, could have loved her more, or told the truth about children. But depression, too, is a kind of fire. And I know nothing of either." of the other to do what it does." I have been a fan of Taylor Mali for many years; ever since I saw his performance on Def Poetry Jam. Since then I have tried to follow him as he published works on various topics. My intrigue for Mali came to a peak when he began posting videos of himself reading poems that would comprise The Whetting Stone. More than once I teared up and, even so, reading this short volume of works. The piece that will always stick out to me, as it did when I first heard it, is "Depression, Too, is a Kind of Fir I have been a fan of Taylor Mali for many years; ever since I saw his performance on Def Poetry Jam. Since then I have tried to follow him as he published works on various topics. Wow! I meant to only read one or two poems and then get on with my day because I have so much to do. It was so compelling that I read the next one and then the next one and finished reading it about an hour or so. What poignant, heart-gripping, poetry! I had never heard of Taylor Mali before, but apparently, he's been on the scene for a while. He's extraordinary. Mali can count me among his fans. I have been a fan of Taylor Mali's work for years, but this chapbook is so different from his past work, which focuses on the advocacy of teachers. In this slim collection of poetry, Mali explores his relationship with his first wife, who suffered from crippling depression, her suicide, and his resilience and survival after her death. Heartbreaking. Is it poetry? Why yes, of course, in every way: pared down to essence, moving like water, heartbreaking and spare and complex and personal. But it reads as story, narrative, gripping drama, tragedy. Mali makes no apology for grit, for ugly, for all wounds laid bare. He also stitches them up with his humanity. I was a fan of Mali's work before reading The Whetting Stone, but I was unprepared for this. He peeled back his skin and showed some of his most raw parts in this chapbook. Reading it was an emotional experience and I am grateful that he decided to share this with us. At first glance, the premise is simple, but these poems are more complex than they seem. For more in-depth discussion, visit my blog: https://outsideofacat.wordpress.com/2... Not an easy book, but well worth reading. This chapbook is sensational..and absolutely heartbreaking. The pages ache with truth and emotion. I am stunned by the raw honesty...and incredibly impressed with Taylor Mali's ability to express his experience, his grief. Congratulations on winning the 2017 Rattle Chapbook Prize...well-deserved! Winner of the 2017 Rattle Chapbook Prize. Review pending. This collection of poems has a really sensational villanelle at its center: "Do Not Think of Suicide as the Ultimate F**k You." Granted, the entire chapbook is a distillation of the poet's painful memories of his first wife's suicide but nothing comes close to this one in terms of economy and effectiveness, rigor of form and unrelentingness of feeling. But that would be hard to do. It's a real stunner. A wonderful book of poems. Very real and honest. Excellent writing. The tragedy of suicide expressed in poetry. Compelling cycle of poems about Mali's wife committing suicide--full of lines & moments that are hard to forget. Def. recommended.